To help our students and graduates make a smooth transition to their new lives teaching English abroad, we've enlisted our ITA Ambassadors to provide us with insider facts and tips for making the most of life in major cities around the globe like Changhua Taiwan. Whether it's finding an English-speaking doctor, opening a bank account, or simply finding a supermarket where you can find the odd comfort food from home (peanut butter! ), our ambassadors have actionable on-the-ground-tips to help you feel at home in your new home city. Please note that things change and we will do our best to keep these "Fact Sheets" updated over time and that current and future ambassadors will continue to provide the most accurate and up-to-date information possible. They have fresh meat, rice, pasta, laundry detergent, soda, ice cream, etc - think of a typical grocery store back home but smaller. They have a second floor with brands we know like Doritos, Skittles, Oreos, Skippy peanut butter and more! Just like it is back home, but times 100. You can buy concert tickets on the ibon machine, get cash from ATM (select the English option), buy soda, candy, sushi wraps (those are a thing here), buy a bag of popcorn and have them microwave it for you, and get noodles and then go to a machine to add hot water to cook them. Charge your phone, grab a microwave meal and they will heat it up for you... basically you can live there, all that's missing is a shower! They have everything you could need from home. Electronics, snacks, clothes, kitchenware, bathroom decorations, stationary, and super cheap camping gear! Get an EASYCARD from any 7-11 or Family Mart and add money to it. It gets you on and off the trains. You can stand or sit on the floor. For a reserved seat, you can buy at the station or online and pick up with your passport or ARC card. The school will take your passport to process your VISA so make sure you have a copy of it. You can buy your tickets here. They run around 8-10,000 NTD ($260+ USD). You can buy them from teachers that are leaving Taiwan at your school or online. Check the Taichung Swap Shop Facebook group page. It's the city closest to Changhua that has more of an expat community. I recommend Christian Hospital. They are all over, and yes, that is the name. Ryan and his sister, Queena, are super nice! Their English is not perfect, but they will understand you. Bring in a picture of the look you want like you would at any hair stylist back home. This is like a cooler version of CVS. They have products from the USA but also products from Japan and South Korea that Buzzfeed would love to get their hands on. Reasonable prices. 1. Pizza Rock: American style pizza and American movies playing on the TV. American music playing too. 2. McDonalds: Just like in the US. 3. Subway: Just like in the US. 5. Smokey Joe's: Nearby city Taichung - Tex-Mex/American-style burgers, fries, and wings! Topcity Mall (Taichung): Has a cool, American-style ice cream shop called Emack & Bolio's with waffle cones covered in rice crispies and marshmallow, fruit loops, and other fun stuff. Taroko Mall (Taichung): No taking stairs, you can ride down a slide to the first floor! Hello Kitty Bowling: In Taroko Mall. SHOWTIME Cinema (Taichung): Reserved seating and the option to add a churro. Stable Fly: Open Fri-Sun, 12pm - 12am. Craft beer, stationary corner with free use of markers, pens, chargers for your phone, leather couches to lounge on, and a cool, artist smoke-free vibe (smoke-free vibes are rare). Aiya Bungu: Open Tues - Sun 12pm - 8pm. The coolest hipster stationary store/coffee shop ever! It seriously feels like something that should be in a hip part of Brooklyn, NY. 3rd Floor Studio: Think a local version of West Elm with a Japanese Flair. It's above Aiya Bungu with the same hours. Just hit search and see what's happening around you. Taichung and Taipei are my favorite places to see what's happening this weekend, etc. Works here in Taiwan just like it does in the USA. Ask a family member for their log-in info and bam, free entertainment that will get you through times of homesickness. Binge watching the entire season of Gilmore Girls while drinking Coke and eating Doritos helped me stay alive. Buy a rain jacket before you arrive - something good like Columbia or North Face. They do sell them here but they are either really cheap or triple the price for US brands... and it rains a lot here! Get one at AAA before you leave the US. It takes 10 minutes and only costs around $20 USD. You don't need to take a test or anything, just sign a couple of lines and have your photo taken. Without it you won't be able to rent a scooter on vacations around Asia or even around Taiwan. They sell any brand you can think of, but shoes by American brands are way more expensive here. Clothes can either be super cheap or just like they would be at home. Buy a comfortable pair for work shoes before you arrive. Everything else you forget to bring clothing wise, you can get here. Don't bring a lot of warm clothes as it doesn't stay cold for long here. Bring a warm jacket and a couple of long sleeve shirts. They will have tons of the same snacks and beauty products you use, so don't go crazy buying them and bring them before you come. However, if there are things you simply can't live without, bring them in case they are not here. Also, feel free to ask questions on the ITA Alumni Facebook group page for Taiwan or any other Facebook group as people are always willing to help others who were in their shoes. Download the LINE app - it's what everyone uses to communicate at school, businesses to confirm your appointments for hair, nails, dentist, doctor appointments, etc. Click here to download this fact sheet as a PDF file. 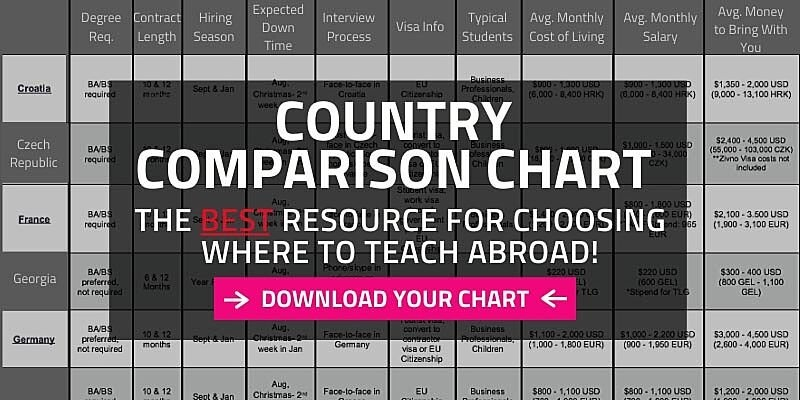 Download your free starter guide or call 773-634-9900 to speak with an expert advisor about all aspects of TEFL certification and teaching English abroad, including the hiring process, salaries, visas, TEFL class options, job placement assistance and more. Taiwan Alumni Facebook Group: Only enrolled students & alumni may post, but anybody can check out the conversation between ITA grads teaching English in Taiwan on a wide array of topics from job tips and apartment hunting to recreational activities & social meet-ups.